Unfortunately, even after over 150 years of research there is still no known cure for this dreadful disease although there are many chemical available that can control its spread. Perhaps the best method of control is to try and avoid infection in the first place but to achieve this we must first learn how to recognise it. It is clearly important to know how to spot potato blight, and the first signs are generally found on the leaflets, leaf stalks or stems. They appear as brownish to purple-black lesions of varying size which expand rapidly, eventually covering the entire host plant. Each lesion has an outer purplish zone which merges into the remaining healthy and uninfected green tissue as the infection spreads. These infected areas become water soaked and soggy, and the host plant is quickly reduced to a rotting pulp. 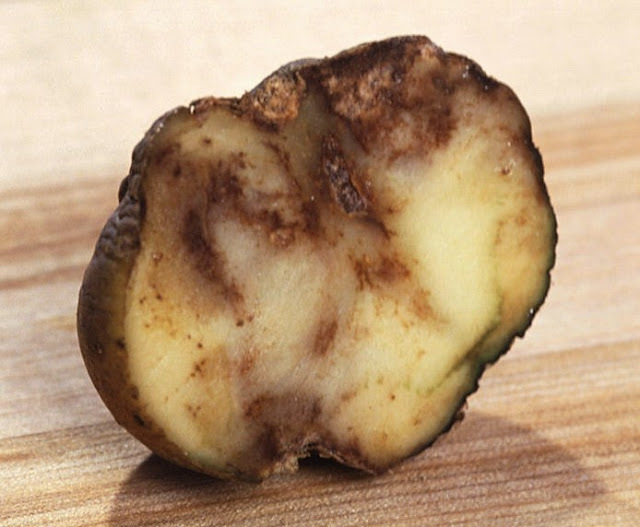 The developing potato tubers can also become infected by any blight fungal spores that are washed off infected foliage and allowed to enter into the soil. 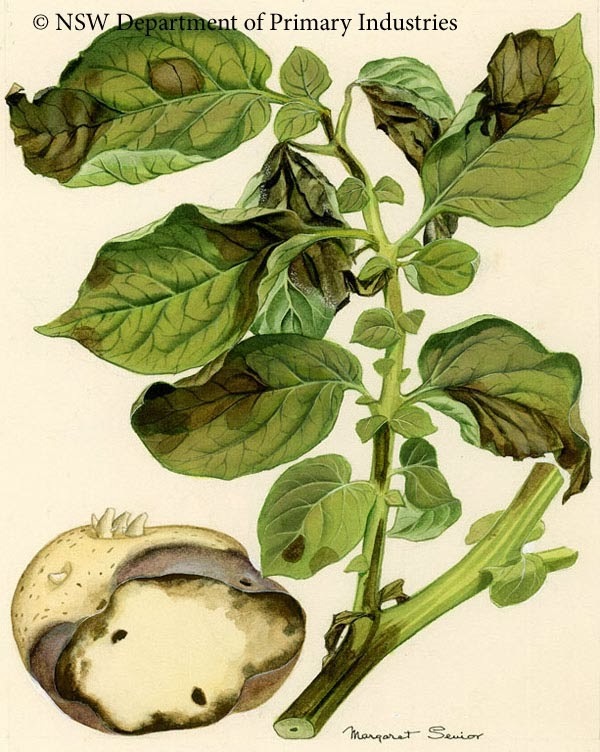 In severe cases the tubers are reduced to a rotten mass of wet flesh, but with a minor attack on the tubers the infection will show up just as a dry rot. This rot won't soften the tissues, but will produce rusty-brown blemishes just below the surface of the skin. This can also can extend further as a variable pattern into the tuber. Main image is in the public domain because it contains materials that originally came from the Agricultural Research Service, the research agency of the United States Department of Agriculture.